Dr Banik and his staff are wonderful! They know I have a strong fear of dentistry and they treat me with the utmost care. Dr Banik always shows me and explains to me exactly what is being done and why. He is extremely patient and kind. Thank you! 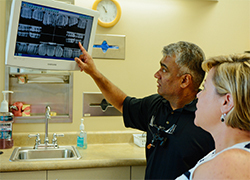 Dr. Banik has been my dentist ever since he opened his practice in North Charleston. I would consider none other! He and his staff are dedicated, knowledgeable, and some of the nicest people I know. I would recommend him without the slightest hesitation. We at Carolina Family Dentistry have been offering extensive general, cosmetic, restorative and preventative care to the Charleston community since 1961. Dr. Ron Banik and his highly experienced team are conveniently located in North Charleston in a state-of-the-art office, complete with the highest-quality technologies and a variety of amenities to make your visit as comfortable as possible. We at Carolina Family Dentistry pride ourselves in delivering excellent care to patients of all ages and walks of life as well as building one-on-one relationships with each of you. We want you to be actively involved in your dental care. Come and see why many of our original patients brought their children to us, and now their grandchildren as well. Let us help you get back to that healthier, happier smile you’ve always wanted. Schedule an appointment with us today! Dr. Ron Banik and the team at Carolina Family Dentistry take pride in customized gentle dental care for the whole family. We believe in educating our patients and empowering them to get and involved in their dental health. Nervous or scared of getting dental work? We have sedation options to help you overcome your fears. Experience gentle care while you relax or even sleep. Dr. Ron Banik and his expert dental team have over 90 years of combined experience helping patients with their smiles and overall dental health. Experience a relaxed atmosphere in our spacious and comfortable state of the art facility. Kids have their own play area while you can enjoy TV or free WiFi while you wait. Work with our team to customized treatment options to fit your needs and budget. Our computerized digital x-ray system allows instant and accurate x-rays but with 50% less radiation than conventional film systems. See full color pictures of your teeth to help you see what we see. A picture is worth a thousand words. Enjoy using our total coverage headphones to watch TV or listen to music during your appointment.